As we end this academic year, we would like to share some successes in making our campus a healthier, energy efficient, and sustainable environment. Our success is the result of strong support and cooperation of the campus community in partnership with the Capital Planning & Facilities Management (CPFM) team. 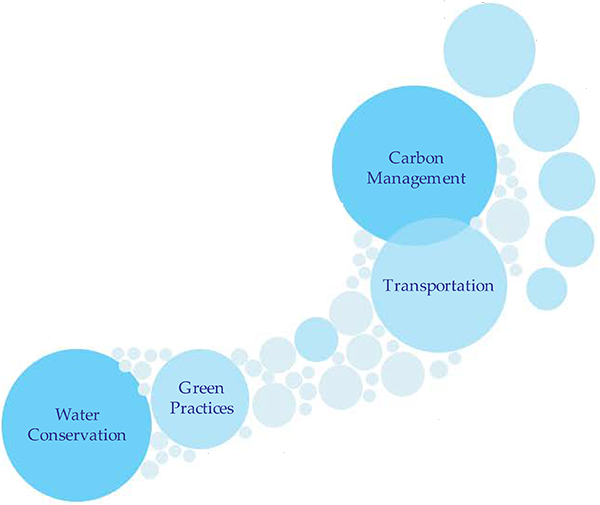 Together we have taken steps to increase energy efficiency, reduce energy costs, reduce water consumption, and reduce our carbon footprint. Since the campus peak year in consumption of 2007/2008, we have reduced the electrical kWh per gross square foot by 12% and therms per gross square foot by 37%, which equates to annual savings of approximately $200,000 and $92,000 respectively. Our carbon footprint has also been reduced by 18.3%, or 1,410 tons since 2008, while bringing the Student Recreation Complex, the University Bookstore, the Greenhouse, and the renovated Science I buildings all online. This is an amazing accomplishment! Installation of water meters at individual buildings, lakes, and landscaped areas to identify heavy water consumption and enable the University to pinpoint areas to address. Installation of "Smart" irrigation clocks across campus that utilize satellite weather and moisture sensors to control irrigation cycles, and save water and electricity to run the pumps. Installation of roofs with improved insulation and high reflectivity at the Library and Cafeteria. Installation of electric car charging stations in Parking Lots 2, 8, and 11, allowing faculty, staff, and students to recharge plug-in vehicles while on campus. Replacement of lights in Parking Lot 2 with LEDs, reducing energy consumption by 70%. Conversion of the Central Plant Cooling Towers' water supply from domestic water to reclaimed irrigation water, reducing City of Turlock domestic water consumption by 20%. A new filtration system cleans, sterilizes and softens the reclaimed water for tower use. 100% of the tower blow down is then captured and reclaimed for irrigation. By using this filtration system, the University is saving approximately 4-5 million Carbon gallons of potable, drinking Management water per year. The California Higher Education Sustainability Conference of 2016 bestowed upon this project a Best Practices Award in Energy Efficiency and Sustainability for Water Efficiency and Site Water Quality. Installation of a large PV system on the roof of the renovated Science I Building. This system generates enough energy to provide electricity to 58 homes per year and supplies energy for all of the electrical needs of the building (excluding the HVAC). Installation of a PV system to support the campus irrigation pump station. Retrofit of showerheads, faucet aerators, urinals and toilets across campus to reduce water consumption. Replacement of two campus cooling towers that had reached the end of their useful lives in 2014 with new, high efficiency cooling towers in the Central Plant, providing HVAC for most of the buildings on campus. Fume Hood Exhaust Improvements on the third floor of the Naraghi Hall of Science - Retrofit of the original, high volume ventilation system to one that uses technology to manage ventilation to the minimum flows through fume hoods to the lowest levels allowed by code. This project reduced overall average ventilation energy requirements by 50-60%. The project produces an annual energy savings of 440,146 kWh and 14,213 therms. The project was awarded a Best Practices Award in Energy & Energy Efficiency at the California Higher Education Sustainability Conference in 2014. Implementation of Central Plant MBx/Retrofit -The project investigated, evaluated and implemented measures to optimize the performance of the campus chilled and hot water distribution systems and the chiller plants and to address operational issues with the intent of reducing energy usage. Stanislaus State made major piping modifications in the Central Plant and campus loop, and implemented control strategies to maximize the energy savingsresulting from these modifications. The annual energy savings have been calculated at 213,998 kWh (24% of total). 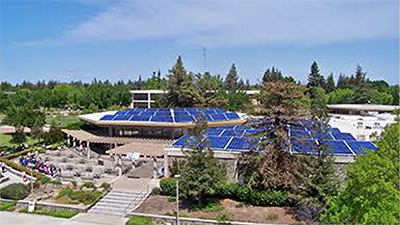 The project was awarded a Best Practices Award in Energy & Energy Efficiency at the California Higher Education Sustainability Conference in 2013. We continue to capture and utilize reclaimed water by the irrigation system, as well as storm water run-off, at the main reflecting pond (holding pond) and campus lakes. Even given this, we have reduced irrigation times by 25%. Installation of drought tolerant vegetation in new or renovated landscape projects across campus, as well as increased use of mulch to maintain moisture in planter beds. Installation of hydration water stations in the Science I Building, Demergasso-Bava Hall, the Student Fitness Center, the Corporation Yard, and at the Swimming Pool to encourage use of refillable bottled water and reduce plastic waste. CPFM, Support Services, and the University Police continue a program to reduce emissions by replacing gas consuming vehicles with electric carts through joint funding from San Joaquin Air Pollution Control grants and operations. Maintaining the HVAC temperature settings at 68 degrees in winter and 78 degrees in summer. Improvements in classroom scheduling of Summer and Winter Intercession classes, resulting in the shut-down of the HVAC system in some buildings and zones during these times. Conversion to a sophisticated, high-speed, web-based energy management system (EMS), allowing a wider range of control and higher level of efficiency from our campus Heating, Ventilation and Air Conditioning (HVAC) system. This system also allows us to control the campus reclaimed water system. Completion of the first campus Bicycle Master Plan. Use of only low VOC paints in the campus paint shop. Diverting an average of 712 tons of waste per year from our landfill through the recycling efforts of every department on campus, and the recycling of used concrete, asphalt, woods and metals. 100% of the cleaning products used across campus are Green Certified, as well as certifications from Green Seal®, Eco Logo®, and GREEN GU ARD®. Green custodial practices have been implemented with equipment and chemicals that require less water, as well as adjusting cleaning frequencies on hallways' carpeting and flooring by 20%. 50% of our campus grounds are maintained organically. Retrofit of existing parking lot and pathway lighting with new LED fixtures, estimated to reduce energy consumption by 65%, in turn saving dollars and reducing our carbon footprint. Installation of a large PV system on the roof of the Cafeteria building. This system is estimated to generate enough power for all of the electrical needs of the building, with the exception of the HVAC system. Installation of an individual building boiler at the Naraghi Hall of Science, which allows the large Central Plant boiler to be shut down off season. Pursuit of grant funding from San Joaquin Air Pollution Control grants for additional electric vehicle charging stations. Continual improvements in classroom, camp and meeting scheduling. Commitments from members of the campus community to turn off computers or utilize sleep modes and to eliminate, remove or disconnect small appliances. Maintenance of temperature settings throughout campus at 68 degrees in winter and 78 degrees in summer. Improvements of fume hood exhaust for the first and second floors of Naraghi Hall of Science. This will retrofit of the original, high volume ventilation system to one that uses technology to manage ventilation to the minimum flows through fume hoods to the lowest levels allowed by code. This is similar to that performed on the third floor in 2014. Addition of a ground water recharging station -Campus excess water can be redirected to the groundwater recharging station. This will essentially recharge the aquifer by slowly "percolating" into the ground for storage in the underground aquafer. Installation of a packaged waste water treatment plant -A possible solution for cleaning and treating our waste water is with a self-contained wastewater treatment plant. Enclosed self-contained systems take in waste water and treat it so it can be added to the campus lakes for irrigation. Many of the utilities savings that have been realized have been reinvested to further improve our efficiencies. Without the help and cooperation of the faculty, staff and students on campus these efforts would not have been possible. 'We appreciate your efforts and look forward to working with you to further help meet our goals in improving our environment and reducing our carbon footprint! See the location of these future projects on our campus. If you have questions or concerns, please contact CPFM at (209) 667-3211, or by email at Facilities_Services@csustan.edu.